Okay so before I get into my review I'd like to point a couple of things out. Number one - these ever so pretty lip crayons are the biggest pain in the bum to photograph so the images we've got here are the best of a very bad bunch. Secondly - no I haven't made the ultimate blogging sin and used a product before photographing it - silly mr 'peach on the beach' decided to turn up half melted in the post. Yes, you can imagine the distress this caused me. Basically what I'm trying to say here is I'm sorry for the shoddy photos and the shoddy melted product. Shoddy, shoddy, shoddy! Anyway, rant over. 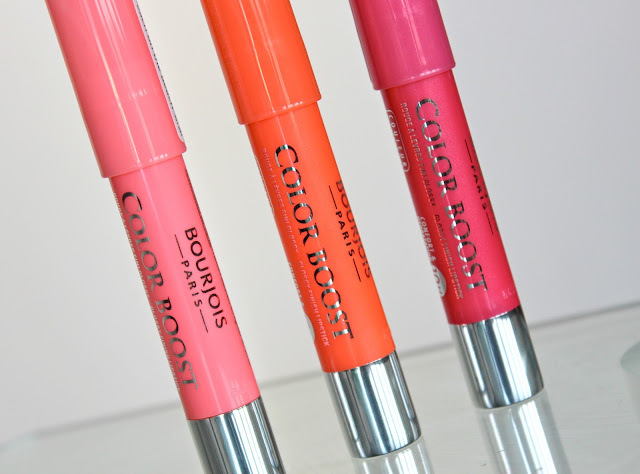 Now unless you've been living under a rock for the past couple of weeks (or you're just not a crazy beauty person like me) then I'm sure you've heard of Bourjois latest lip offering, the Colour Boost lip crayons. Ever since the release of the infamous Clinique Chubby sticks, the makeup world has gone a little bit crayon crazy and high-street brands have been quick off the mark to recreate their own version of the well loved lip crayon. First it was Revlon, then MUA and Models Own and now we have Bourjois and their offering. I have to be honest when I say I wasn't that excited when I first heard about the release as I'm more of a classic lipstick kind of girl and the thought of applying what looks like a childs giant crayola crayon to my lips has never really appealed to me. However, whilst perusing Superdrug recently (as you do! ), I spotted the Colour Boost crayons and decided to give them a little swatch. My oh my, I instantly fell in love. 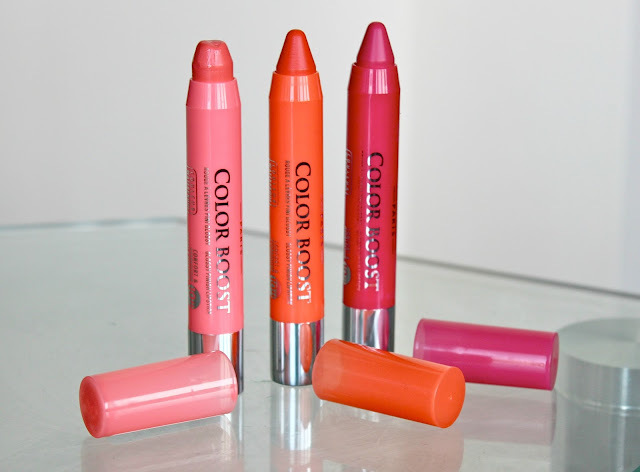 Creamy, pigmented and moisturising, what more could a girl want from a lip product? However, I resisted temptation in Superdrug as I knew Boots would have a 3 for 2 deal on at some point and I'd be able to pick them up a little bit cheaper. I'm glad I had my thinking cap on that day as I was right and the words 3 for 2 were soon screaming 'buy some Bourjois lip crayons' right at me from the Boots website. So thats exactly what I did! There's four shades available which are very nicely named 'Peach on the Beach' (a pale peach), 'Orange Punch' (a red toned Orange), 'Fuchsia Libra' (a blue-toned berry pink) and 'Red Sunrise' (a deep Raspberry). I decided to get the first three shades mentioned as I thought they were the most appropriate for Summer although I would like to get my mitts on Red Sunrise when A/W rears its ugly head again! My favourite shade to wear so far has to be 'Peach on the Beach' as I find it to be the most pigmented and perfect daytime neutral shade. I've been wearing it for work and its perfect! I'd say the formula of these lip crayons are somewhere between a lipstick and a lipgloss - think lip balm with a wash of colour. They aren't as pigmented as I originally thought after my swatching sesh in Superdrug but they still give a nice wash of colour none-the-less. In fact, I actually like that they're quite sheer as it makes them very wearable and perfect for every day use when you don't want to wear a bold lipstick or quite frankly can't be bothered to make much effort. 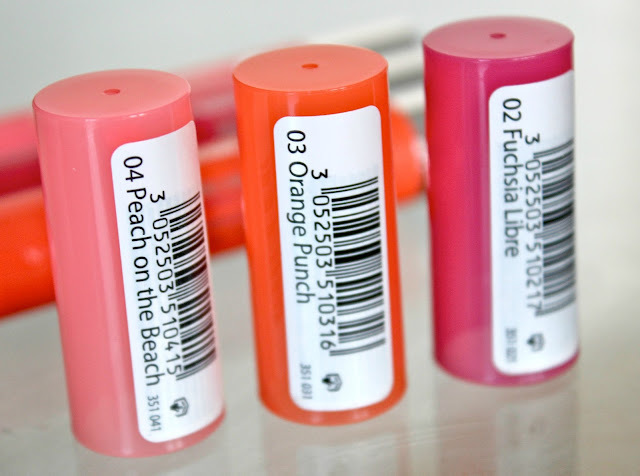 The balm consistency also means they're super glossy which makes for a nice fresh and natural summer lip. In terms of staying power, I'd say they last a couple of hours at the most before they need re-applying. I know that isn't great but as they're a glossy product I never expected them to have great staying power and it doesn't bother me too much anyway as the chunky crayon applicator makes them super easy to re-apply wherever you are. They also feel very moisturising on the lips and don't cling to any dry patches which is great as I've been suffering from really dry lips lately. I'm blaming last weekends antics at T in the Park for that! 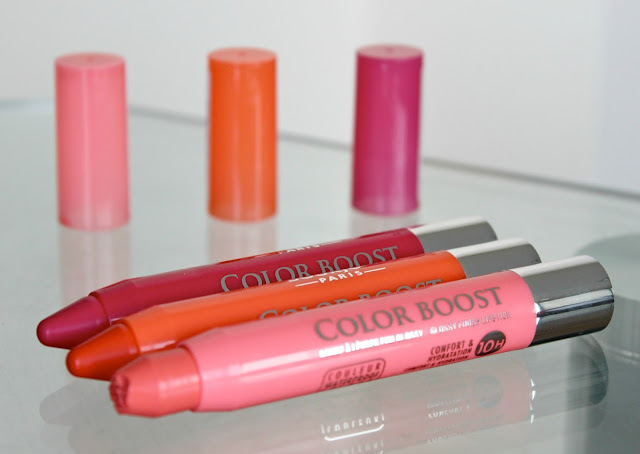 Overall I'm really impressed with the Colour Boost lip crayons and I'm very happy to have them in my collection. If you'd like to snap some up, they cost £7.99 each and are still available to buy here on the Boots 3 for 2 offer. Have you tried these lip crayons? Which is your favourite? P.S - You might of noticed that my blogs had a bit of a makeover. I've been wanting a change for a little while now and I'm absolutely thrilled with the new look. I'd love to say I designed it myself but unfortunately I'm not that clever and its all down to the lovely Felicity who writes the fabulous blog Pursuit of Felicity. 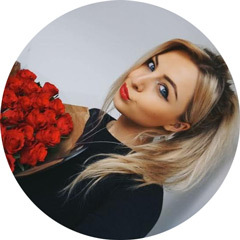 She's a super talented lady so if you're after a new blog design, look no further. I can't recommend her enough! Ahhhh such gorgeous colours, I need to get my hands on these ASAP. Orange punch looks amazing I really want to try it! Really informative review. Peach on the beach is definitely ny favourite of these. They are lovely for the summer. I've got Peach on the Beach and can't stop using it! Great post! Peach on the beach is gorgeous! Shame it melted in the post, you should have sent it back they might have sent you a new one. Love these hun :) can't wait to get peach on the beach! I need the rest of them! I have the darkest pink colour and that is really pigmented, a couple of layers makes it almost opaque! God I need to add these to my make up collection! I love the Revlon lip crayons so these would be right up my street, they look so similar! The fuchsia shade is gorgeous! I love wearing shades like that! I really want to try peach on the beach! I've got a couple of the MUA ones which are fab, but peach on the beach is calling my name!! Peach on the beach colour is amazing i love it! I enjoy reading your blog it fab. These are on my pay day wish list! I keep swooning over them every time I'm in Boots!! Errrr the photos aren't shoddy miss! 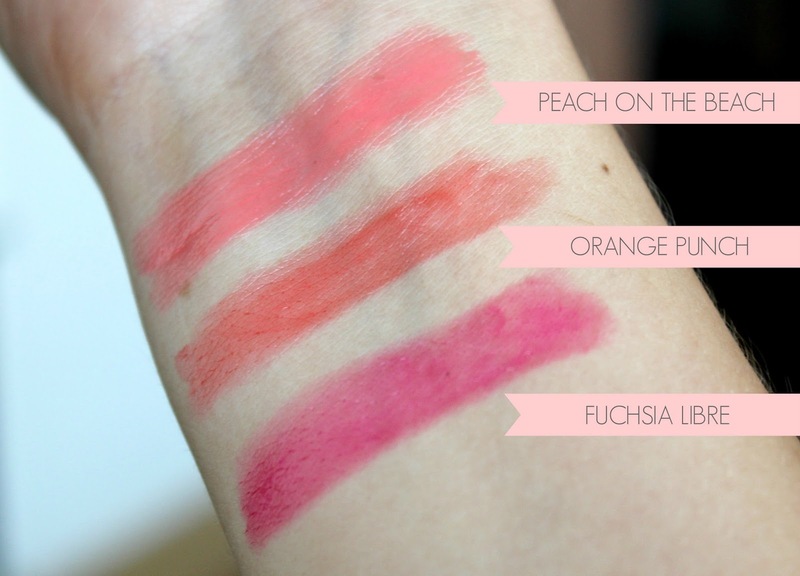 Peach on the beach looks lovely, definitely one for the summer!I'll have to swatch these next time I'm in Boots! Oh that Fuscia colour is sooooo nice! Love the look of Peach on the Beach, I really want it. i thought its from revlon! hehe.. but still they look gorgeous! I just saw Zoella rave about these! Really want to try them out since I wanted to try the Revlon Balm Stains, but she said these are way better! I really want to try these now! Peach on the Beach looks lovely! I might have to pick it up next time when I'm in Boots. They all look gorgeous, especially Peach on the Beach :) x.
Ooh these look fab definatly think il try these out. I love these... it's wonderful. I love these lip crayons, too! They're the perfect blend of lip balm and colour. I love them. Did I mention I love them? The shade 'Orange Punch' is my favourite at the moment. I did my own review on A Duty to Beauty - here's the link if anyone's interested in a second opinion! Hey, I just found your blog and love it :) These look really good, definitely going to pick some of these up when they come on sale in Australia!